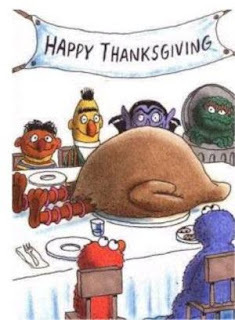 Hope everyone is having a Happy Thanksgiving. I still haven't had a morsel of food because I have spent the day working. Covered the Foran vs. Law high school football game in the morning (Foran 44, Law37), then came home to bang out a quick game story and get on Randy Edsall's 2 p.m. conference call. Blog, another story, and then it's turkey time. Here's what came out of the call...No new injuries or depth chart changes. Erik Kuraczea is probable, everyone else a full go. Dave Teggart has kicked well at practice this week, his mechanics are fine, Edsall said. The team practiced today, and some of the locals were allowed to go home for Thanksgiving. Edsall said it was like the Indianapolis 500 out of the practice facility today, which makes sense since the guys have to be back on campus by tonight for an 11 p.m. curfew. And a few random observations and notes before we get to the picks. My 2-year old is obsessed with Sesame Street. I made the mistake of picking up an Elmo Christmas DVD for five bucks in the bargain bin at Target last week. Every morning since, I've been awoken at 6 a.m. by him shoving the corner of the DVD case in my face, saying, "Elmo. Please. Elmo. Please. Elmo. Pleeeeeeeeeease." Thus, I went with the Big Bird Thanksgiving photo to lead off the blog today. Nathan's makes a killing every Fourth of July with it's hot dog eating contest. So why hasn't someone come up with a Thanksgiving dinner eating contest? Boston Market could sponsor, and it'd be an instant hit. It wouldn't have to be speed eating, either. All the contestants would get a 20-pound turkey with all the trimmings. Then they get two hours to eat as much as possible. Just imagine the tryptophan kicking in around 90 minutes and Kobyashi passing out face first into a bowl of yams. Come on...tell me you wouldn't watch. What a bizarre week in college football. And so much surrounding UConn and Notre Dame. Charlie Weis is done, and so are the Irish. If you saw the video of them half-hearted singing the Notre Dame alma mater after losing to UConn, you saw a team with zero left in the tank. No chance in hell they beat Stanford this weekend. Then, an irate fan punches out Jimmy Clausen outside a restaurant. ND's athletic director cancels Weis' planned recruiting trip out west following the Stanford game like a father taking the car keys away from his teen aged son because he failed Chemistry. And then, Weis gets a vote of confidence from, of all people, Brady Quinn. Who's next, Rick Mirer? Maybe Ryan Leaf can vouch for him, too. Perhaps Tom Williams was buried knee-deep in Harvard game tape. But you'd have thought the Yale football coach must have heard at least a little of the endless discussions dissecting Bill Belichick's 4th-down call earlier that week. I was one of the few who didn't have a problem with Belichick going for the kill there on 4th-and-2. But it's impossible to defend Williams' decision to go for it on 4th-and-22 from his own 25 with a three-point lead over Harvard late in the fourth quarter. Sure, the Crimson could have wound up winning anyway. But make them work a little to get there. Yikes. This video is pretty darn funny. Just give it a chance. On to the picks. We began the year with around 20 competing each week, and the field has been trimmed to roughly 11 regulars. As a Thanksgiving Day treat, I'll provide an expanded menu of games to whet your appetite. Time to pull on my eatin' pants with the elastic waist band. ame 10: USF (+6) over Miami-Fl. Chip, not that it's going to make a difference in the grand scheme of things, but I'm pretty sure I had 8 wins last week. Gary, Just double checked and got 7 for you again.